Choosing the best fishing bag for your next fishing outing can make a huge difference in the type of experience you have on your next fishing trip. A fishing bag is a necessary item that any serious angler should have as part of their arsenal. Beware not all fishing bags are made the same. There are some cases where you will be sorely disappointed in the bag and never use it. Not every manufacturer offers the best fishing bag. Understanding what makes a bag best can help you to choose a bag that you will be happy with and that will enhance your fishing expeditions. Why Choose a Fishing Bag Instead of a Tackle Box? A tackle box takes up far more room than a bag does. A bag although sturdy has soft sides so it is far easier to use when it comes to expansion to hold extra items. It is lighter weight and more comfortable to carry. It is a much better choice for many reasons. Some diehards are not willing to part with their tackle box because they have yet tried a high quality fishing bag. If you need something that offers more compartments than a tackle box which can help to keep you more organized than a fishing bag is the right choice. The real beauty of a good quality bag is that it is lighter and easier to carry. There are certain qualities that you should look for in a fishing bag that will help to ensure that you are going to be completely happy with your new bag. Any angler can tell you that space is always limited when fishing. Whether you have to sacrifice some of your gear or give up some personal comfort items you wind up not bringing along something that you wanted to. You may find that a bag made for fishing can help you bring along everything that you have had to left behind. The first thing you should consider when you are looking for a bag is what size bag you will need to accommodate all your gear and whatever else you want to take along with you. The size ranges vary greatly so you will want to really give it some thought. The size is important but so is the number of pockets and compartments. Ideally you want a compartment or pocket for each set of items that you normally carry with you. When each item has its place you spend a lot less time searching around for the items or taking out precious time to untangle items. The zipper is a rather innocuous item to have to consider but on the cheaper models the zipper often jams, breaks or tears away from the material. Zippers of lesser quality can be the first thing to go on a bag and render it useless. Look for bags with molded or poly zippers to keep the risk of corrosion away. Stitching is very important on a bag that is going to be jammed packed with gear. Double or even triple stitching is what you should be looking for. The material is a huge telling sign of what quality bag you are dealing with. High quality fabric resists fraying and tearing. Other value added items are things like rings and areas where you can hang stuff from, interior box organizers and rubberized bottoms. This can be a tricky subject. The bag may look great with metal hooks and rings but the reality is metal rusts and your bag will be exposed to plenty of water. Look for bags that have taken corrosion issues into consideration. Also consider that having tackle organizers can come in handy but not if they are really used to brace the bag. They may look great and can help to keep you organized but the bag should be able to stand on its own without the organizing boxes in place otherwise it totally takes away the flexibility to use the bag for other things that you may want to use it for. Look for bags that have sturdy padded straps. Remember no matter which bag you choose you will have to carry it. Comfort is important when you are trying to reach a favored fishing spot that you have to walk too or climb over fences to get too. How do you want to carry your bag? There are different styles that can make carrying your gear a lot easier. There are cross body bags that you can sing across your body so your hands remain free. Backpack style bags obviously are carried on your back again freeing up your hands. Shoulder bags that can be slung over your shoulder and even bags that have smaller carry handles so that you can carry it like a traditional tackle box. The choice is all about personal preference. We have found for heavier loads you cannot beat a backpack but if you are in a kayak a backpack may not be the best choice you may want to consider a cross body bag for easier access and easier mobility. Frankly the best fishing bag is going to be on the high side of the cost spectrum. The old saying you pay for what you get really applies to these bags. You should spend a little more upfront so you know your bag will last more than one season. The lower price bags just cannot hold up. The Wild River by CLC is the Cadillac of back pack fishing bags. It is truly awesome! It has an integrated LED light system that keeps the bag lit up so you can see what you are doing in low light conditions. If you are THAT guy that just loves all the bells and whistles you will love this backpack. 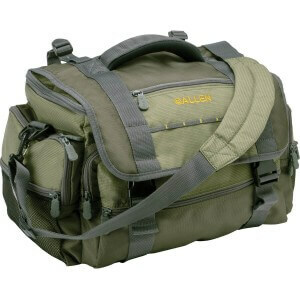 The front flap folds down to provide a great work surface which makes it one of the best fishing tackle bags available. The rain cover is easy to deploy when you need it. It comes complete with 4 PT3600 trays that stack up nicely. There is a permanent molded sunglass tray in the top of the bag with easy access to keep your shades safe. It has mesh pockets and a plier holder that goes easily from bag to belt so you always have your pliers handy. This really may be the best fishing tackle bag on the market. It has high quality poly zippers so no worries about corrosion even in salt water environments. It also has a retractable lanyard to keep tools handy. We liked this bag because it is a no fuss type of bag. It offers very good quality at a very good price. Does it have all the wow factor that the Wild River by CLC has to offer, no, will it get the job done? Yes. This is a big bag that you can wear on the shoulder or across the body. It has ample room for everything that you need including waders if you are so inclined. It has plenty of generous compartments and stands alone. The bottom is rubberized. The interior is a bright yellow, which makes it easy to see the contents. It has a molded zipper which is great to ease corrosion worries. It is a generous sized bag that you can use as you see fit. It is well made and built to last. It is also a fraction of the cost of the Wild River so if budget is important to you this would be a good choice. This is the least expensive model that we considered. It is decent. Is it a must have an amazing bag? No it is not. It is an awful lot like a gym bag but built to withstand the wear and tear of carrying fishing gear into a slew of unfavourable conditions. We liked it because it is really affordable. It is well made and offers enough room to be able to take what you really want to take. It offers a built in tool retractor which is nice. It has 5 pockets and enough room to carry 6 3500 utility trays (which are not included but at this low price no one would expect that they would be). It has a detachable shoulder strap which makes this a nicely versatile bag. Users have all left positive feedback about this bag. The best fishing bag for you may be any one of the bags listed here each bag offers durability, organization and convenience features that will prove useful to any angler.